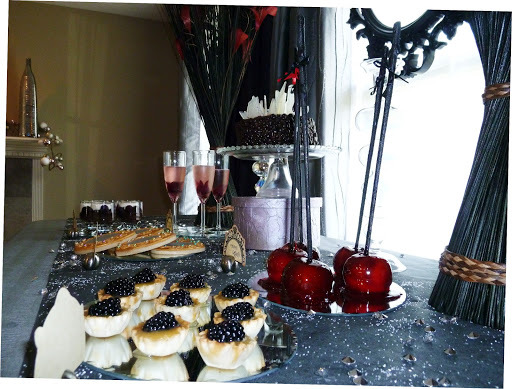 Evil Queen Dessert & Cocktail Party, inspired by the movie Snow White & the Huntsman by Squared Party Printables. 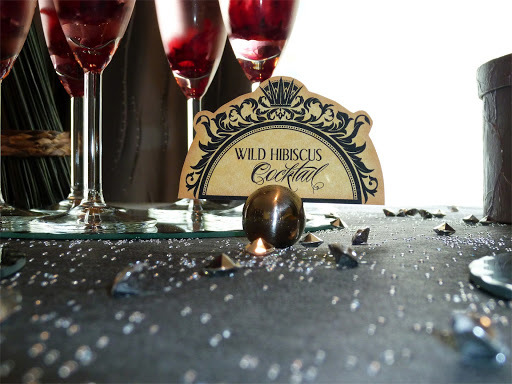 Squared Party Printables sent in this party, with inspiration from the movie Snow White & The Huntsman, love the edible flowers in the drinks, the ice candy in the cake! 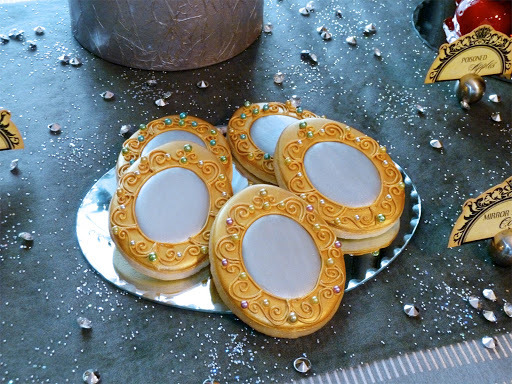 and the mirror cookies are just gorgeous! 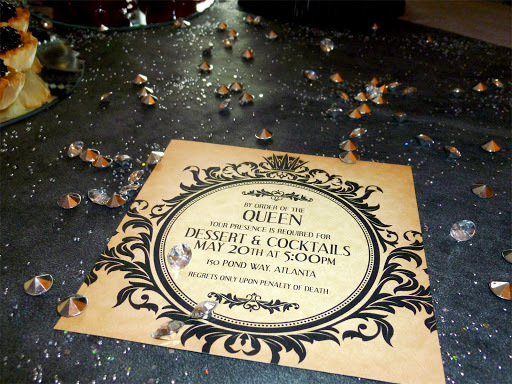 “In keeping with the dark themes of the original fairy tales, we created this Evil Queen Desert & Cocktail Party, inspired by the movie Snow White & the Huntsman. 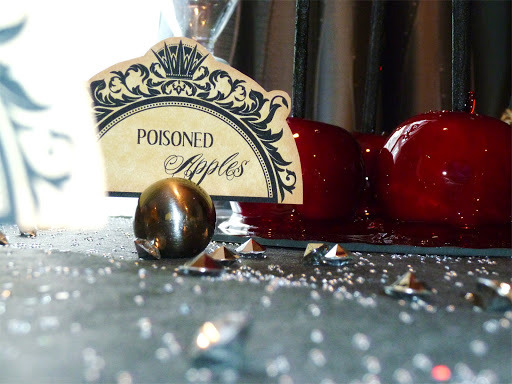 The first question we asked ourselves was “why should princesses have all the fun?” With Snow White getting most of the recognition as of late, we just had to put something together worthy of and representing the Evil Queen. No self-respecting Queen would start her day with anything less than a fabulous mirror and that’s where we started our party planning. 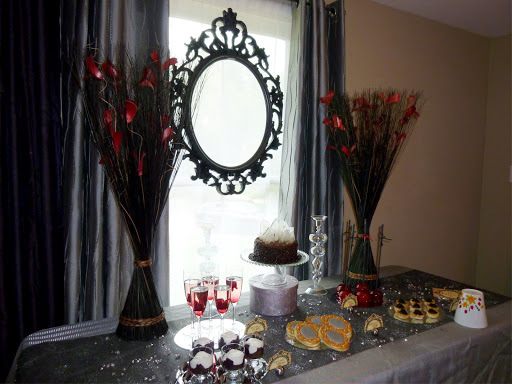 Our party decor is based on the theme of the Dark Forest and includes the Queen’s beloved mirror, which was strung up with fishing wire to a double curtain rod to get that floating look. We found the bundle of branches tipped with red leaves at Pier 1. 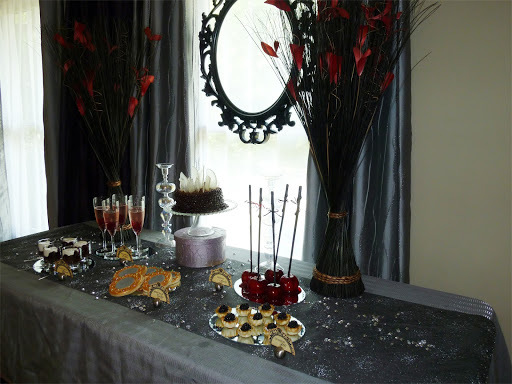 To add some bling, we added mirrored serving plates (candle plates), some dark and sparkly linens and a runner made of galaxy paper. 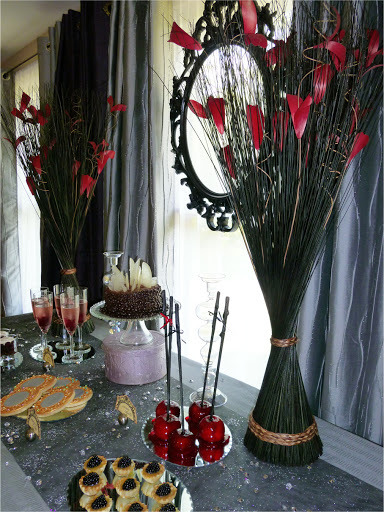 We scattered the table with loose “diamonds” from the dwarfs’ mine and added iridescent glass candlesticks. 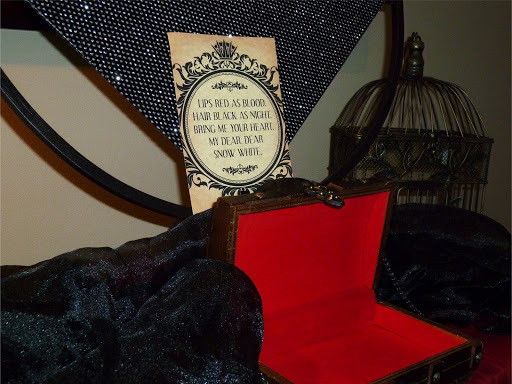 We even added a wooden box which serves as the location to place Snow’s heart once she’s been caught. 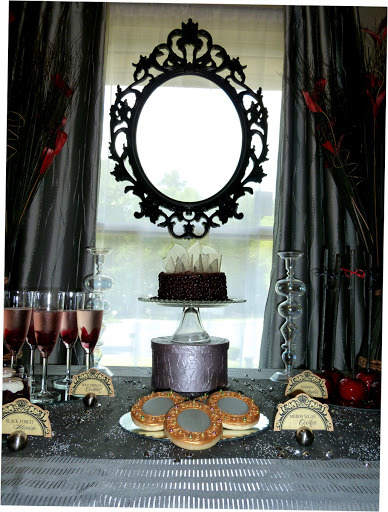 The party invitations and matching buffet labels perfectly match the black mirror backdrop. 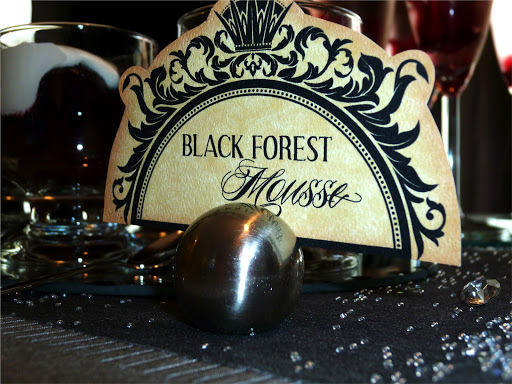 The desserts and drinks give a nod back to the dark forest theme. 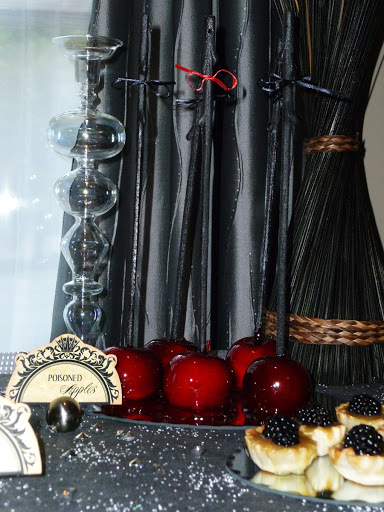 We had poisoned (candied) apples, black forest mousse, custom mirror cookies from Casey’s Confections, simple blackberry tarts with lemon curd and a chocolate studded cake erupting with shards of glass from the Queen’s own broken mirror. 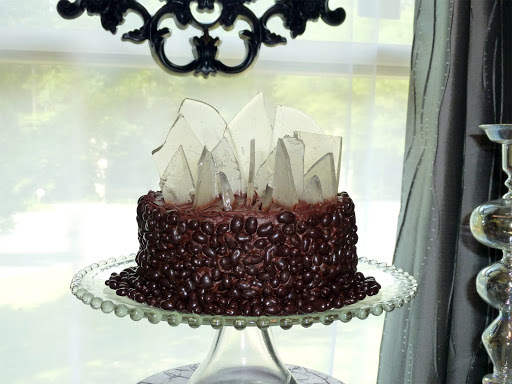 We crusted the sides of the cake with dark chocolate-covered pomegranate seeds and topped it with edible “”shards of glass”? 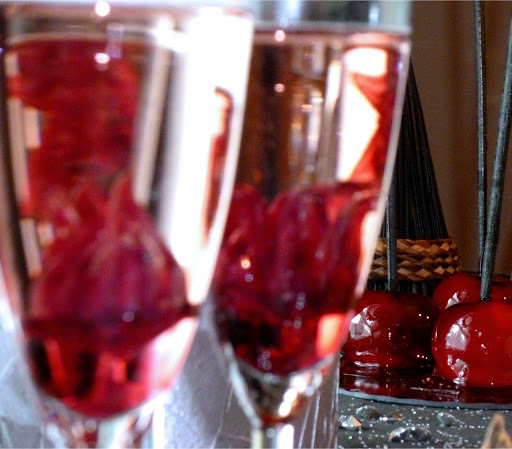 that we custom ordered from Vintage Confections. 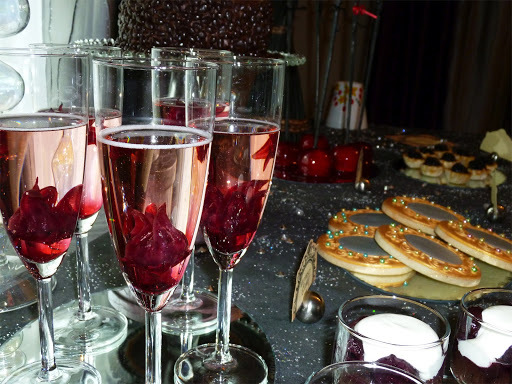 Drinks included a wild hibiscus cocktail using Prosecco and hibiscus flowers in syrup and a poisoned apple martini (regular apple martini using black vodka). This was such a fun, grown up fairytale theme.